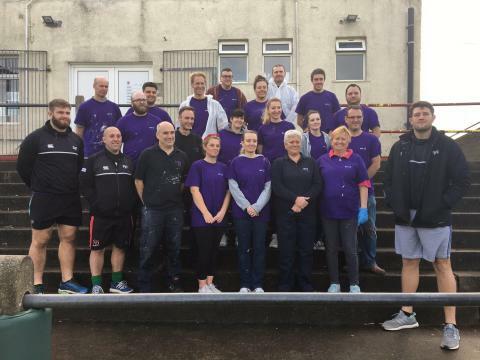 Ospreys players and staff recently joined forces with more than 20 BT Cymru Wales volunteers to give Bonymaen RFC club house a much needed helping hand. The WRU Division 1 West Central club, famous for developing Wales and Lions legend Alun Wyn Jones, enjoyed a deep clean and mini-makeover thanks to the small army of volunteers and strong link that exists between BT and the four Welsh rugby regions. Working closely with Ospreys in the Community it was decided that Bonymaen RFC was a worthy recipient of BT’s helping hand. The whole club house was given a spring clean and the lounge, entrances and bar were all given a fresh coat of paint. The ladies team, who were Division 3 champions last season, were also given a surprise with their team room receiving a complete makeover and tidy. Every year BT staff are encouraged to volunteer three days of their time to the local community. This forms part of its commitment to working with communities and being aware of its social responsibility. Across the UK BT staff volunteered the equivalent of 40,000 days in 2016/17 towards local causes which ranged from cleaning local rivers to teaching software programming to local school children. “The club are incredibly supportive of both the Foundation, and Ospreys Rugby, so it’s nice to be able to play a part in both organising and doing something to repay that support. It was so nice to see everyone working so hard together to do something to benefit Bonymaen and we’ll be looking at ways in the future we can do other volunteer days to help benefit the community around our region. “B&Q in Swansea were incredibly kind and donated the supplies that were needed and Subway also gave a huge discount on food to keep the workers going all day. We’re also grateful to the Ospreys players who came down after training and mucked in to help get the job done. “It’s a remarkable change. I came in at 9am and people were already cleaning the place before they started painting. The transformation within 6 or 7 hours, well I just can’t believe it to be honest. The BT and Ospreys in the Community staff have made a great team and there’s been lots of banter. It’s been great for the club because it certainly needed the lift”.